Our last field trip of the school year was a success! 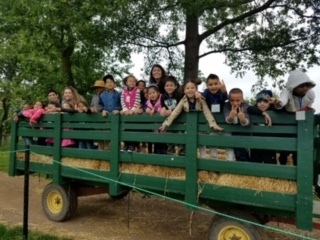 We got to go on a fun and bumpy hay ride around the grounds, churn our very own butter and eat it, and feed some hungry farm animals. All the kids had a great time at the Queens County Farm and we even beat the rain! Special thanks to Mr. Correa for helping us out today with the students as well as being an excellent photographer! Next Entry:204B Learns About Air!